= The player no longer receives messages directly to a personal email account. I miss getting content from secondary characters but do not miss having to close the app every chapter to see if a new one had appeared. = Three acts of five chapters each net you more content than previous titles but also cost more at $5.97 total rather than $3.99. + Each character has a unique prolog. It keeps the plot and characters voices consistent. 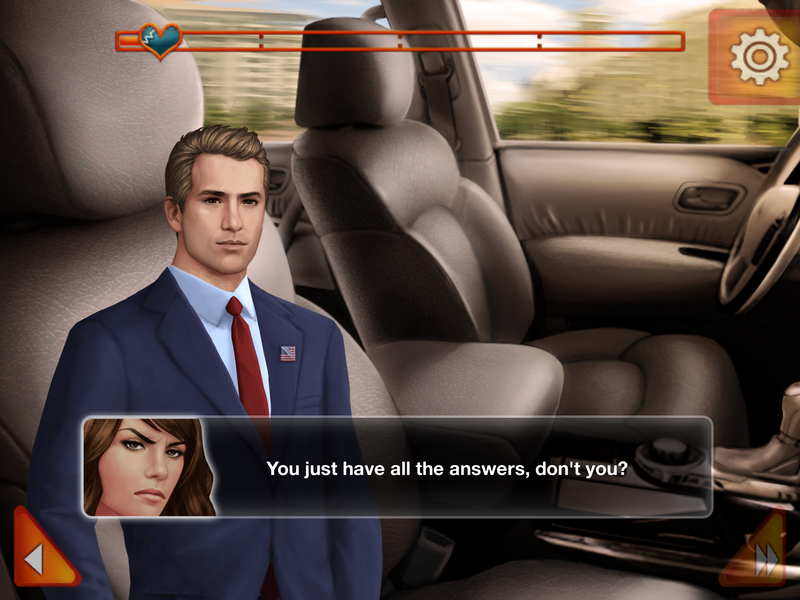 + All four endings unlock upon completing the route, and each ending differs significantly. It’s worth reading them all. + Save slots, a rewind button, and a relationship meter keep the player from having to reread huge batches of text if they make a mistake or miss something. 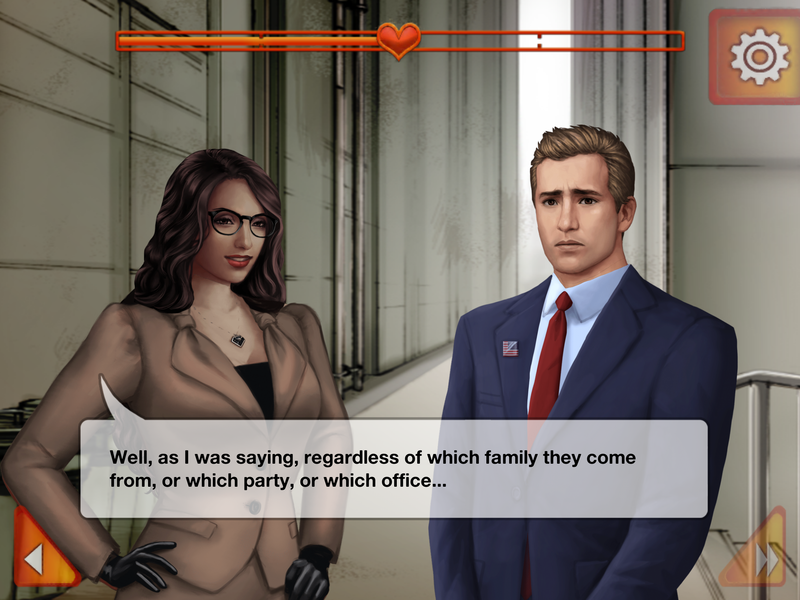 + The sprites have many poses, and the MC’s expressions now appear in her dialog box. 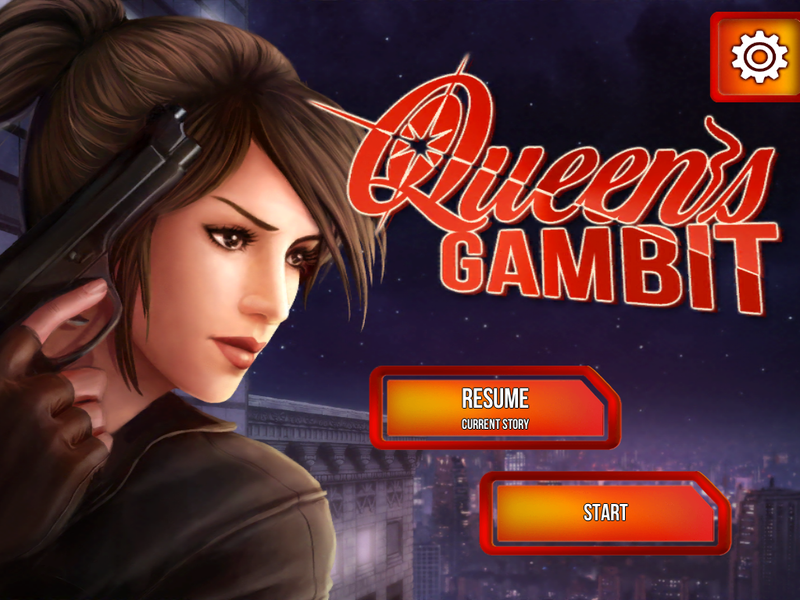 + Sound effects and how the text pops onto the screen emphasize the action and mood of a scene well. + As I noted in a previous review, Voltage USA’s gun illustrations up to this point have been terrible. 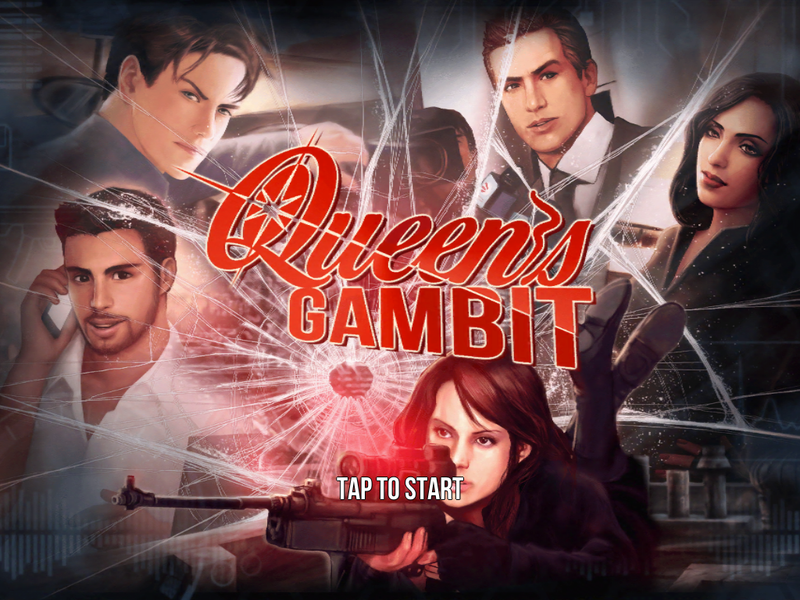 Queen’s Gambit‘s illustrations are a huge improvement. No sprites hold weapons that I remember – which keeps the description of a particular gun from clashing with the visual – and the few stills that feature guns have them held properly. 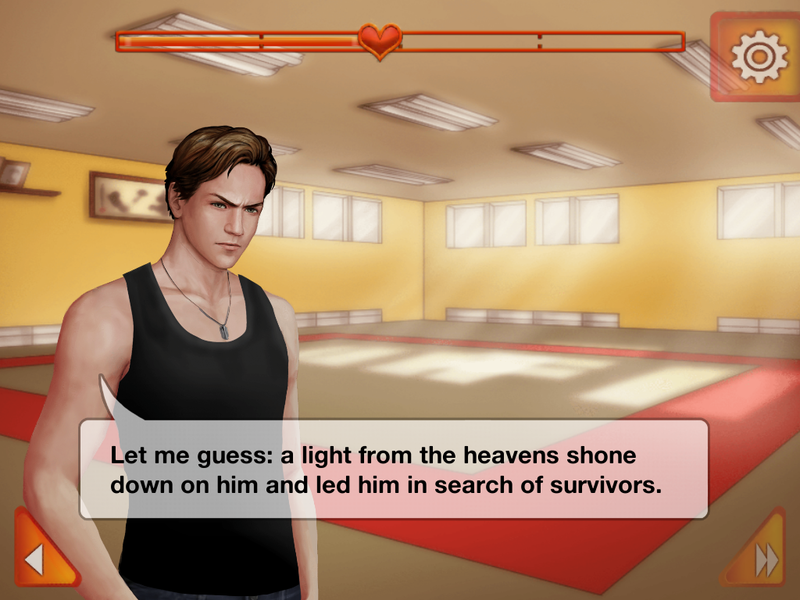 Overall I like Emmett better than João, but the main plot is not as strong. Since this comes down to a matter of taste, I’ll give a few general points before digging into more specifics and spoilers after the jump. I really like Emmett as a character. He’s focused, intelligent, kind, and has a slightly goofy sense of humor. He has issues, but he doesn’t pity himself and has enough perspective to address his problems. He also ties into White Lies & Sweet Nothings (though none of those characters cameo like Speakeasy Tonight‘s Neil does, darn it). The two leads may get together as a couple by the end, but for most of the route Emmett and the MC feel and interact like what they are: long-time, close, adult friends. 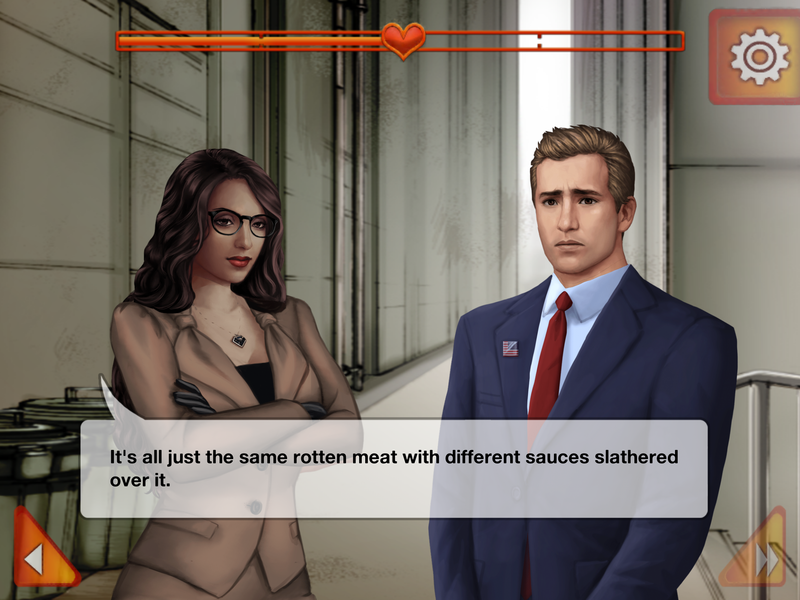 I actually love the slower buildup, hesitation, and having the few little romantic interactions being able to be reasonably brushed off as friendship, but I can see players who expect more mush in their visual novels being frustrated. The MC mentors Cameron (the team’s rookie) well. 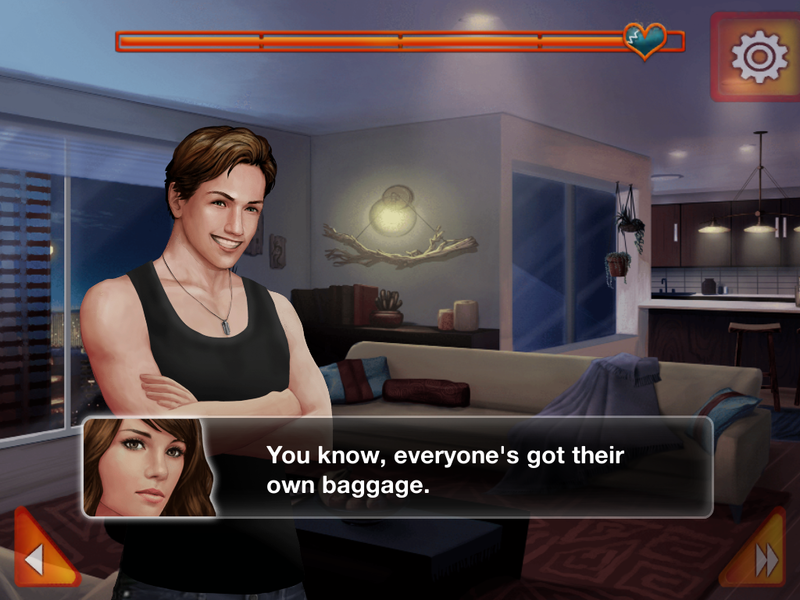 The main plot ties into the MC and Emmett’s history. It starts unraveling towards the end though. If inaccurate medical details can completely destroy your suspension of disbelief, you may want to skip this story. It reaches Master and Commander levels of unbelievable. +Each character has a unique prolog. It keeps the plot and characters voices consistent. On the MC: I really like this one. She has a definite history and motivations which weave nicely both into the plot and into her attraction to João. She’s fairly intelligent, competent, and has a nice balance of idealism and skepticism. Now, if I could just add a dash of snark, she’d be perfect. Don’t worry, Emmett. Your route’s next on the list. On the Romance: I really like that the MC takes a while to switch from a professional attitude to a “crud I really like this guy” attitude. The relationship is built slowly on values and goals the two truly share. Compared to other Voltage USA titles, the story has fewer romantic moments, but I don’t see where more would have fit in the narrative. 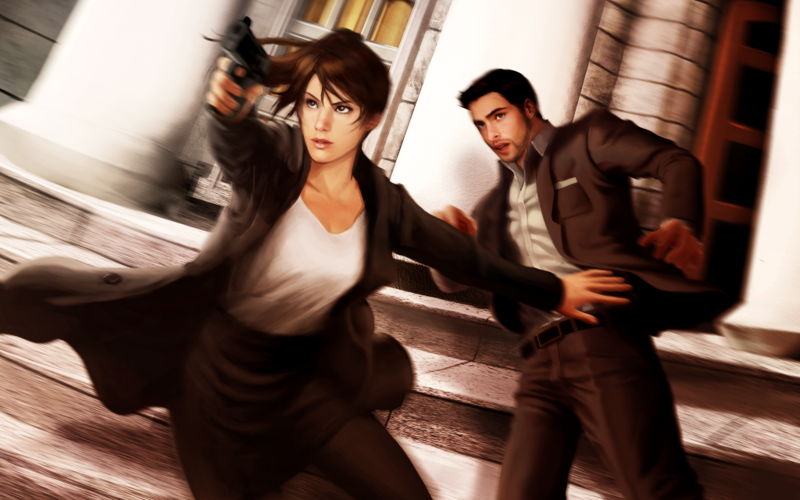 On the Main Plot: The spy plot never felt copy-pasted and stayed away from one-liners. As long as you don’t squint too hard at the Client’s motivations (or why top spies do not use burner cell phones) you’ll be fine. On “Stop Using Your Fictional Characters to Lecture Me Please”: I’ll admit I was apprehensive during the first few chapters of this route. I don’t enjoy seeing one stance on a political or social issue portrayed as THE CORRECT THING AND EVERYONE ELSE MUST BE COMPLETE IDIOTS even if I agree with it. 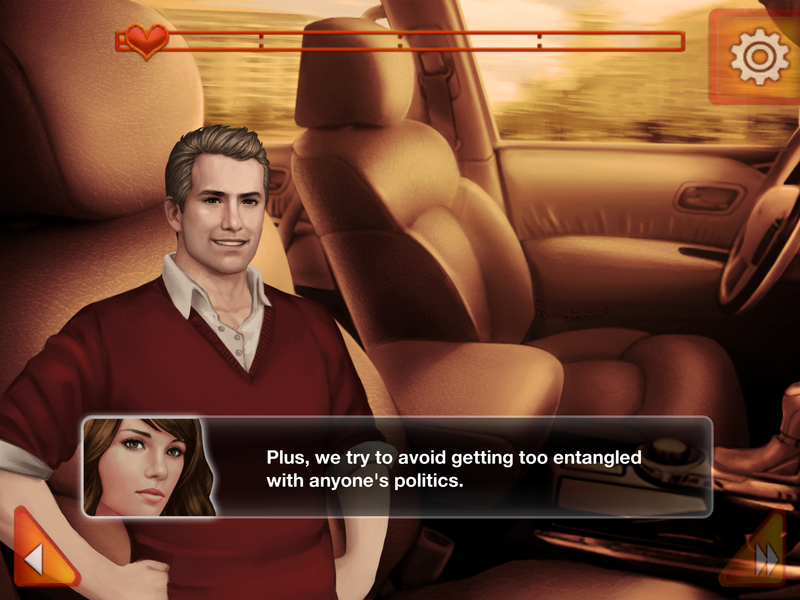 Fortunately, the writer gives both characters representing the issues some flaws, some shading, and no one person or position has a perfect solution at the end of the route. On the Tone: I was surprised and pleased at how ambiguous the world is. While I respect the two main leads and some of the secondary characters, many of their actions gave me pause. João researches ways to improve the environment, yes, but chooses to do so in an area outside any countries’ jurisdiction in a manner that could potentially be as damaging as the problems he’s trying to correct. The MC lies and kills for an organization that she trusts helps others, but we never get a proper explanation or proof that they are not, in fact, doing terrible things to good people. Read the nightmare ending at least once. My jaw was on the table. 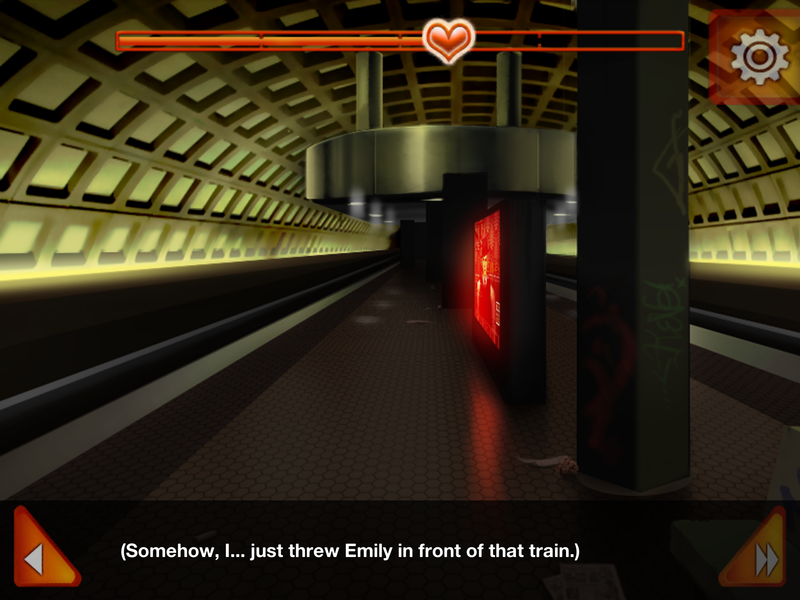 I now want to read every route just to see what the nightmare ending is for each one. On Secondary Characters: This is a fun bunch. 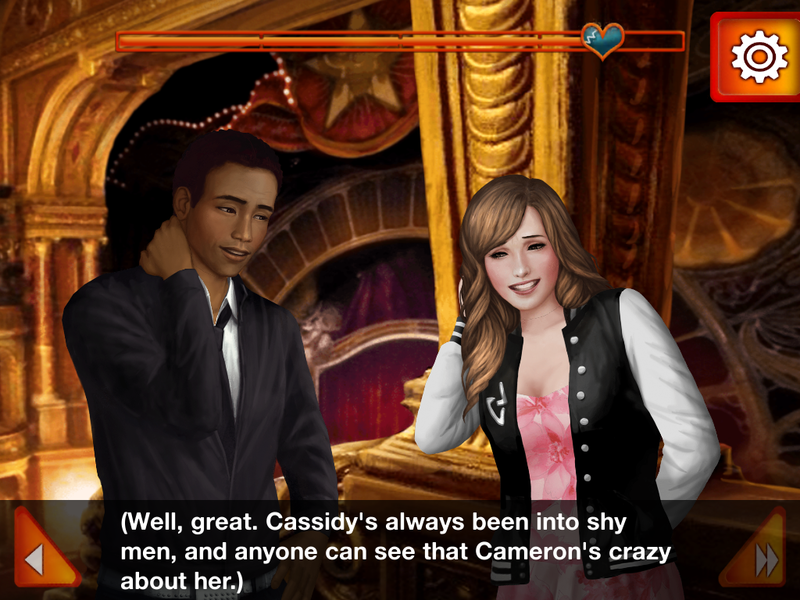 My favorite is Cassidy, the MC’s younger sister, but Cameron, the team’s rookie, is close behind her. I see it’s time to take him into the study and have a heart-to-heart. Bottom Line: Recommended. While João himself is not my cup of tea, puzzling out the main plot and learning about the MC’s relationships with the secondary characters kept me intrigued. More Cassidy and Tom please!